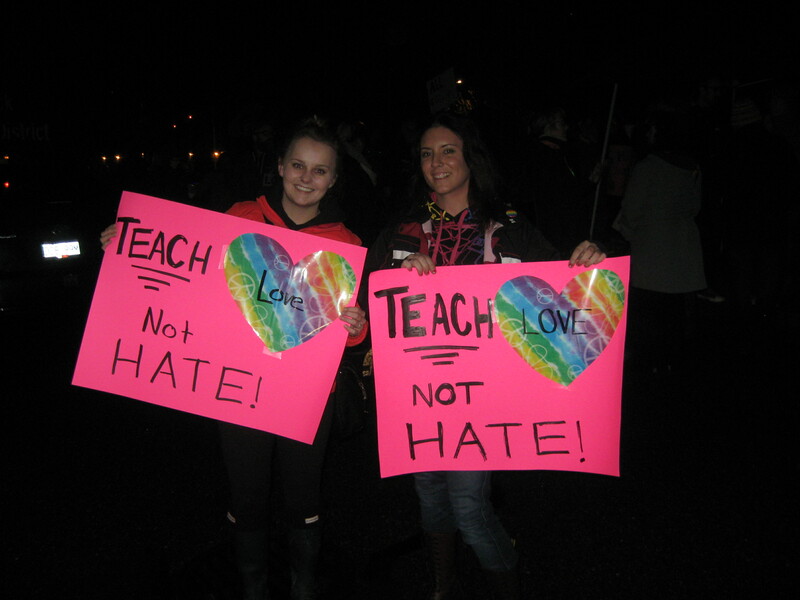 Chilliwack – Some 250-300 people braved the cold and a little spotty drizzle to rally for pro SOGI and LGBTQ rights in general at Chilliwack School Board on Tuesday Evening. The intent was to send a message to the Board that inclusion means everyone and the recent comments by School Trustee Barry Neufeld are not the same as the majority of Chilliwackians. Inclusion for all regardless or sexual orientation. NOTE : Neufeld has withdrawn as liaison to committees directly connected to the Board for the remainder of his term (up to October 2018 and the next Municipal Election). 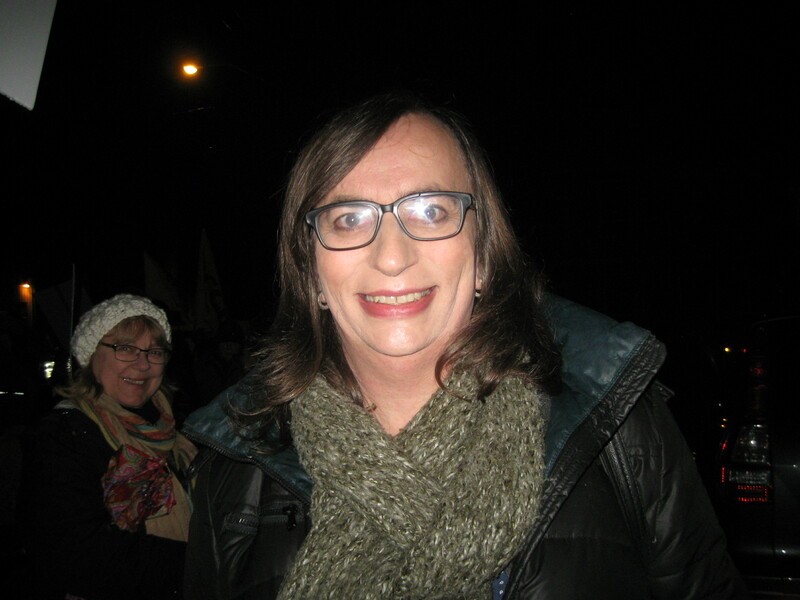 Morgane Oger, transgender activist, BC NDP Vice President once again made the trip to Chilliwack from Vancouver. She asked the board if they will support “the law of BC that they are sworn to uphold” in supporting all students, free from all forms of bullying and intimidation. Neufeld said he supports all students while the other trustees went further to mention bullying and intimidation regardless of gender, race and sexual orientation. No politicians showed up although Council hopeful for next year, Louis De Jagger said he wanted to be there, but he had commitments at SFU. Anne Russell from UFV was in the crowd of supporters. The school board meetings are on line and can be found here. The Q and A on SOGI et al happened at the start and at the end of the November 28 meeting. Board Chair Paul McManus asked protesters to realize that SOGI is a complicated topic and asked protesters asking questions, to be respectful of board members as well as Roberts Rules of Order. McManus expressed concerns that SOGI and SOGI 123 must still be vented through the School Board and evaluated through discussion. The last five weeks have seen many distractions before the discussion can get into the details of the program. NOTE: That SOGI 123 has yet to be implemented into the School curriculum according to McManus. Other districts have implemented the program. The concern seems to be the lack of explanation from various parties including the Ministry of what the SOGI program is and what will or will not be implemented. No one from Culture Guard, whose Chair, Kari Simpson, made major statements on SOGI last week against the education program, showed up at this rally. Willow Reichelt , the rally organizer, spoke with FVN before the regular school board meeting. Parent Yanick Cad told FVN that the reason she was there, let alone the others that lined Airport Road, was to teach her children that their school were safe and all inclusive. Sometimes you have to protest to make sure your voice is heard. One of the other contentious issues was the plan to spend $850,000 to renovate the School Board space by moving the learning services department to an old site in East Chilliwack. 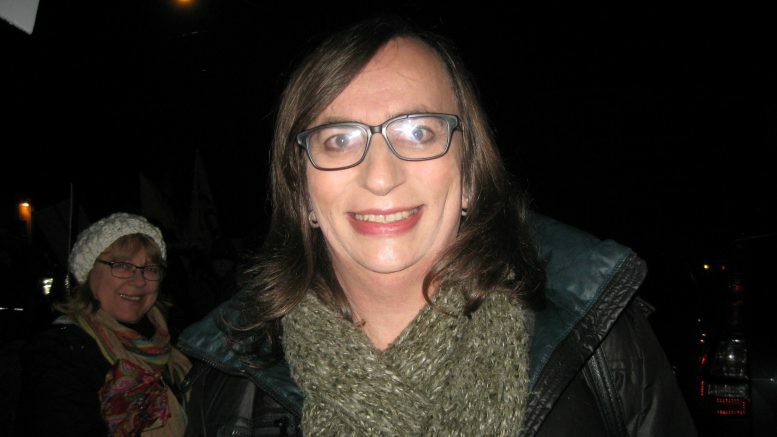 2 Comments on "Pro-SOGI and LGBTQ Rally At Chilliwack School Board Office"
Correction for 7th(I think) paragraph: “…SOGI and SOGI 123 must still be vented through the School Board…”. I’m sure that should be “vetted” not “vented” (despite what some may think! Don I did an actual head-count at 6:20, and got 300. More arrived thereafter, so 350 is a solid participant count.